I don't know who the eff died and made Denton the new Austin, Texas, but someone did. And I experienced it first-hand Friday night. When I told one of my editors that I was going to Denton on Friday night, he responded, "You go to Denton??" And I was like yes, why is this a big deal. I used to date a Denton boy. We used to go on dates in the square, I think, unless I'm confusing him with another Denton boy and now I don't remember, but anyway, YES, I'VE BEEN TO DENTON, WHY IS THIS SO WEIRD. I'M COOL. But apparently I'm not cool. 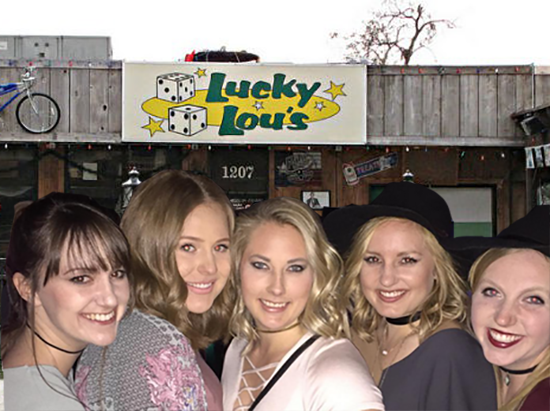 Let's meet the bros I met at Lucky Lou's in Denton, Texas on March 25, 2016 A.D. I was waiting patiently at the bar for a drink, I leaned over to a 5-foot-2 tiny man and said, "I feel like I'm not cool enough to be here." He said, "Because you're not," and then I beat him up. Not really, but I walked away and told every girl in the bar not to talk to him, so same thing. i said u don't tell my thigh-high boots i'm not cool enough for this bar no sir. Bro #2 and I literally bonded over hating Bro #1. I saw him snapchatting Bro #1 and said, "Yeah, Snapchat him to all your friends because I hate him." He giggled and said, "Yeah, he's a douche." Then I sat down and made small talk with him and by made small talk, I mean I told him I worked in biology and my name was Maria. A few minutes later, my friends come by and tell him my real name, as in my first, middle and last name, and then he got really mad that I lied to him as if we were meant to be married. I said, sir, calm down. I met Bro #3 while he was playing pool and I was trying to distract him. He called me abrasive, but said it was a good thing. He told me he was a handyman and then mentioned how frustrating it is to play pool with a bunch of 21-year-olds. I asked him how old he was and he said "about to be 24." I know Denton bros and me seem like any other typical Friday night, but it was especially rock bottom when a 5-foot-2 college bro told me to my face I wasn't cool enough to be there. Pls think about me tonight during your nightly prayers. I need it.